Derives feature models (slope, curvature, roughness, etc.) from grid models based on the local grid neighbourhood defined by a kernel. In general, the features are derived based on an appropriate underlying functional model. All slope related features, for instance, are calculated based on the best fitting plane defined by all valid grid points within the kernel. Curvature related features, in turn, are derived from a best fitting paraboloid. Multiple features can be calculated simultaneously simply be specifying a list of grid features (feature). For each specified feature a separate grid file is calculated. The output grid file names (outFile) can either be specified explicitly, in which case a user-defined file name has to be specified for each feature. In case no or only file name is specified, unique file names are automatically created by adding the eature name as a postfix. The output grid files containing the feature rasters are created in GDAL supported format (oFormat). 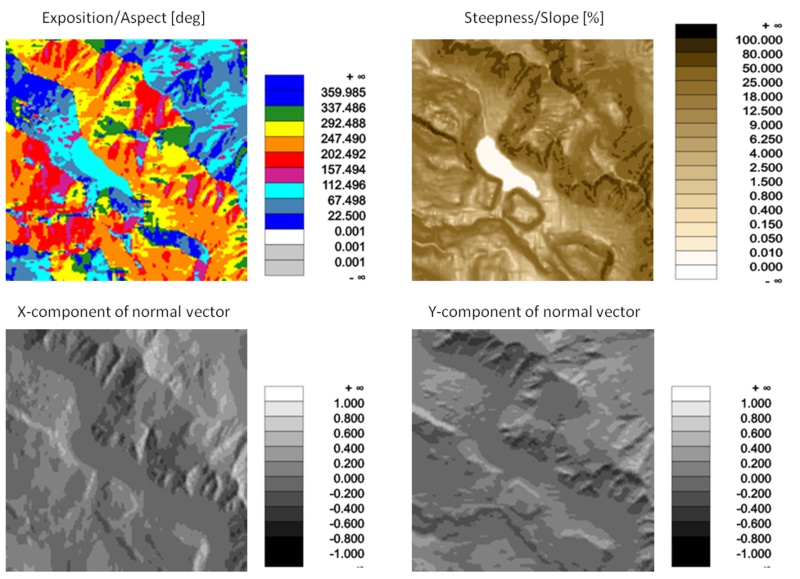 Please note that the feature grids are created in the same structure (resolution/extent) as the input DTM (inFile). Optional user defined limits can be specified to restrict the area of interest (limit). Please note that, irregular limits are automatically aligned to the grid structure of the input raster as re-sampling is strictly avoided. Estimation rule: The current directory and the name (body) of the input file are used as file name basis. Additionally, the postfix and the extension are constructed according to the specified grid feature and oFormat (e.g. '_slope.tif'). To select a predefined shape of the (binary) kernel matrix. To specify the kernel radius. A value of 1 corresponds to a 3x3, a value of 2 to a 5x5, [...] kernel. If no user defined limits are specified or -limit is even skipped, the entire xy-extents of the input raster model are used. The following examples rely on the grid model albis.tif located in the $OPALS_ROOT/demo/ directory. This first example demonstrates how to derive different slope feature grids (slope/steepness, exposition/aspect, x/y components of surface normal vector). Since only the input file (albis.tif) and the feature list (slope, expos, normalx, normal) where specified, the default kernel settings (kernel radius: 1, kernel shape: square) were used. Consequently, for each grid point a best fitting plane was estimated using the grid point and its eight neighbours. The requested features are all calculated from this (tilted) plane. The names of the output grid files composed automatically based on the input file name and using the standard feature postfixes. (albis_expos.tif, etc). In the second example different curvature rasters (minimum/maximum/mean/gaussian curvature) are derived. Hereby, a circular kernel shape and a kernel size (radius) of 2 pixels is used. Figure 3 shows colour coded visualizations of the resulting curvature rasters which were derived using the following commands.